Novelist and playwright, born on the 3rd of July, 1983 in Wejherowo. Dorota Masłowska's career began with the publication of several poems while she was still a student at Gdańsk University. While a student of cultural studies at Warsaw University, she enjoyed a great deal of success with her first novel, Snow White and Russian Red (Wojna polsko-ruska pod flagą biało-czerwoną) and soon became a regular columnist for some of Poland's most respected weeklies and monthlies. Masłowska's debut was the diary she submitted for the Twój Styl magazine competition in 2000, but her literary career began in earnest with the novel, Snow White and Russian Red (2002), which won a Polityka Passport Award, the Sopot Złote Pióro / Golden Pen Award and a nomination for the Nike Literary Award. Incidentally, the book's publisher, Lampa i Iskra Boża, managed single-handedly by Paweł Dunin-Wąsowicz, made enough profit on the book to launch the magazine, Lampa, which has since had a regular presence on the market. In 2006, Masłowska won a Nike Award for the novel, The Queen's Spew. With its vulgar language and a rather chaotic form, Snow White and Russian Red provoked much controversy while gaining a number of devoted followers, including Jerzy Pilch who twice offered praise for Masłowska's book in his column in the Polityka weekly. Some of the misguided interpretations can be attributed to the advertising campaign for Snow White... which promoted the book as 'the first tracksuited slacker novel', suggesting it offered important sociological observations about this aggressive subculture. It would, however, be a similar mistake to apply the term 'waiter novel' to Henryk Worcell's Zaklęte rewiry. In an interview for the magazine, Ha!Art), Masłowska referred to Silny, the narrator and main character of the book, as a 'mental tracksuited slacker' and a 'receptor of media noise who is equipped with mass memory'. Her book is, therefore, more of a grotesque novel created out of a deliberate misrepresentation of common views while showing pop-culture in a distorted mirror. Secondly, the characters in Snow White... are representatives of various subcultures, and the term 'tracksuited slacker' is used as a symbol of the degeneration of modern life rather than a direct reference to reality. Indeed, one needs to be careful of a literal reading as it contains such gems as Dzień bez Ruska / A day without the Russky (a politically incorrect event with the beauty contest providing the culmination of Silny's adventures), a sand factory owned by a Zdzisław Sztorm (Storm), 'a blue car of the police brand' and, finally, 'Dorota Masłoska' who interrogates the book's main character then lectures him on Baudrillard's simulacra. After a four-year gap, Masłowska published her next novel, The Queen's Spew, daringly styled as rhymed hip-hop, and with the irritating chorus, 'This song was written with EU money, it aims to increase the number of fools in society'. With characters such as the wretched pop singer, Stanisław Retro, his ruthless manager, his lover and fan, and the monstrously ugly Patrycja Pitz who becomes a hip-hop star through a series of coincidences, the novel plays with media and pop-culture stereotypes. Among the book's most scathingly portrayed characters is Masłowska herself, harshly ridiculing her own media success and life in Praga, Warsaw's right-bank district. Soon after Masłowska turned to theatre, writing two plays: A Couple of Poor, Polish-Speaking Romanians (Dwoje biednych Rumunów mówiących po polsku) in 2006 and No Matter How Hard We Tried or All is Right Between Us (the title being a verse from a song by the punk group, Siekiera [Ax] - Między nami dobrze jest) in 2008.The former. a grotesque based on national stereotypes, shows a couple pretending to be two poor Romanians called Parcha (a sit-com actor in real life) and Dżina (a pregnant single mother) as they joy-ride across Poland. They meet a number of people on their way to the ferry, and a toxic psychodrama evolves, with Parcha demonstrating his supremacy at all times, ending in Dżina's suicide. Maslowska, too, wishes to draw attention to the new stratum of ‘semi-satisfied middle-class citizens’ who don’t see the reality of poverty. The idea expressed in the title – that Dzina and Parcha are pretending to be Polish-speaking Romanians – is, she says, 'A joke which isn’t really so funny at all. In Poland there are no Romanians, but there are the Roma minority. It’s a symbol for a certain sort of person, a gypsy standing on the street in a long skirt'. In the Soho’s production, that Roma minority in Poland is translated into the eastern European minority in London: 'We have cockney accents, but with Polish soul,’ explains Riseborough, 'and as Romanians we do bad impersonations of Romanian accents'. Masłowska, however, was not deterred by the lack of success, and she turned out her second play, No Matter How Hard We Tried in 2008. Theatre critic Justyna Sobolewska called this play, 'a macabre comedy about Poles who do not know who they are - or might not be there at all'. The play's three characters are women who represent three different generations of a family and cannot find a common language: the grandmother who keeps reminiscing about the war, the mother who reads supermarket newsletters, and the daughter who identifies with the subculture of heavy metal music. With the intention to demonstrate that 'there is no statistical Pole', Masłowska writes about the co-existence of different attitudes and eras; the events spoken of by the three women happen simultaneously. Besides this formal device, the play stands out on two counts: one being the use of Nineteenth-Century language, the other being its kinder-than-usual attitude to all things Polish. Bringing together people from different generations and walks of life in Poland, the play pushes them to face up to the idiosyncracies of their characters through the spectrum of being 'Polish'. She picks apart the commercialism of this world, juxtaposing it with the realities of families who barely get on. She mocks celebrities and media personalities - she uses dramaturgy to attack every aspect of modern life in Poland in order to get to the essence of 'Polishness' and to whether it is, after all, a good thing or a bad thing. On the surface, the play appears to be a comedy, however Jarzyna's characteristic style uses humour to carry the sinister aspect of being a Pole in a world where Poland doesn't actually exist. The main characters are a market cashier Halina, her silly daughter the Little Metal Girl and her wheelchair-bound mother. These are women who are not living in a world that no longer exists once it turns out that Granny had been killed during the war and so never gave birth to Halina. Masłowska's language gives punches throughout, stripping each character of any pretense and baring their souls in tribute to the non-being. One of the characters declares, 'I owe a lot to nonexistence and non-being; on one hand I am NOT nobody, but on the other I am no Polish , for instance'. The Polish character, fraught with complexes accumulated through centuries of persecution and oppression, is an anxiety-ridden wreck. Masłowska tries to piece together this wreck for the sake of posterity. Masłowska follows many generations of Poles who have taken it upon themselves to explore Polish identity, but rarely has it been done in so cutting, so brazen a style. Certain themes are familiar to audiences of the same region, inflicted by a similar history. Up until now I wrote about the so-called here and now, it was enough to step outside of my house and everything spoke to me, now I had to work within a world carefully constructed from bits of another reality. I had to create everything, build it bit by bit. Ambitious, but also very laborious. But it was out of exhaustion with the matter of Poland that a completely abstract subject took over me, I needed an escape, an excursion. an artistic and literary trend announcing the crisis of high-brow art and literature and, in consequence, advertising the need for low-brow, substitute productions with catchy plots, aestheticism, numerous quotations and mixed conventions. My thinking goes: one third of an advertizing copy, then a bit from a poem and an excerpt from religious instruction for ten-year-old schoolchildren. Such a vision of reality is often disconcerting, and may explain the unfavourable critical responses. Most of the critics, however, are guilty of failing to recognize Masłowska's writing style and of ascribing her deliberate formal devices to a lack of skill or understanding. The truth is that while Masłowska's radicalism can indeed be discouraging, you cannot deny the forceful and frequently dazzling consistency of what she has written thus far. My creativity intensifies when I am forced to learn something new, when I am so unsure, that it pushes me to play games, pretend I can do something I really can’t. Obviously everything that I do is word-orientated, so it is no surprise that lyrics are the cause and the heart of the album. – said Masłowska when asked about her motivation to take up new artistic activity. Somewhow I came to a point where I felt paralyzed as a writer. Having grown-up from social commitment and being interviewed on that subject back and forth I started feeling like my own parody. Meanwhile, the need to yell about principles has to come straight form your heart, it has to be risky. 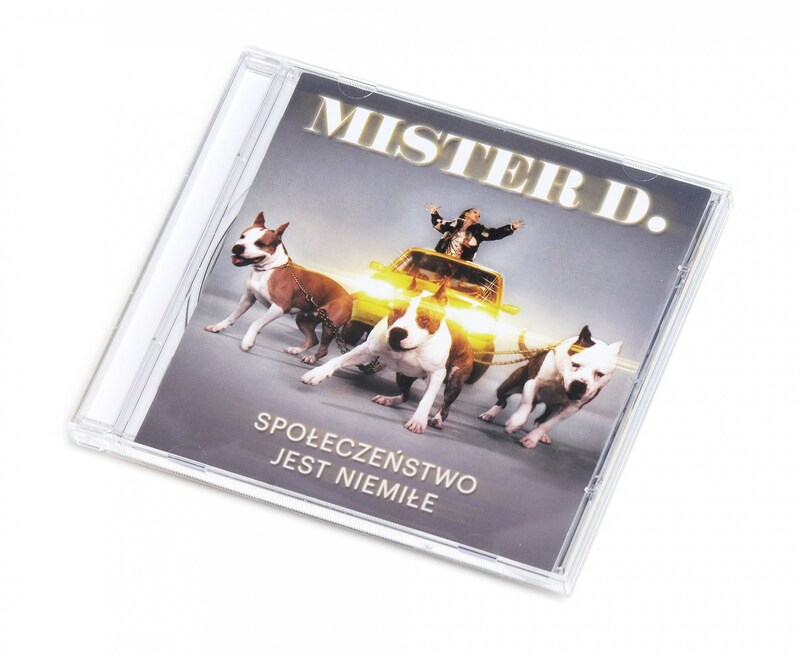 For me, this album I also a self-mockery, a jeer of my media image, of a ‘Dorota Masłowka product’ . Album was prepared in cooperation with artists, such as Marcin Macuk (known from his cooperation with Hey, Pogodno, Katarzyna Nosowska and Brodka) took care of music production, while Krzysztof Skonieczny (an acclaimed music video producer) overlooked the production of the video. Raster Gallery undertook the role of the publisher. Four years after the famous premiere (2009) of No Matter How Hard We Tried on the stage of TR Warszawa, its artistic director Grzegorz Jarzyna directed a film version of the play. The first pre-release screening was held at the International Film Festival T-Mobile New Horizons in Wrocław. Wojna polsko-ruska pod flagą biało-czerwoną / Snow White and Russian Red, Lampa i Iskra Boża, Warszawa 2002. Paw królowej /The Queen's Spew, Lampa i Iskra Boża, Warszawa 2006. Dwoje biednych Rumunów mówiących po polsku /A Couple of Poor, Polish- Speaking Romanians [in:] TR/PL. Antologia nowego dramatu polskiego, Teatr Rozmaitości, Warszawa, 2006. Między nami dobrze jest / No Matter How Hard We Tried (drama), Lampa i Iskra Boża 2008. Jak zostałam wiedźmą/ How Have I Become a Witch, Kraków: Wydawnictwo Literackie, 2014. Więcej niż możesz zjeść. Felietony parakulinarne/ More Than You Can Eat. Paraculinary Column, Kraków: Wydawnictwo Literackie, 2015. Červená a bílá [Wojna polsko-ruska pod flagą biało-czerwoną], trans. Barbara Gregorová, Praha: Odeon, 2004. Snow White and Russian Red [Wojna polsko-ruska pod flagą biało-czerwoną], trans. Banjamin Paloff, New York: Black Cat, 2005. Schneeweiss und Russenrot [Wojna polsko-ruska pod flagą biało-czerwoną], Köln: Kiepenheur und Witsch, 2004. Lengyel-ruszki háború a fehér-piros lobogó alatt [Wojna polsko-ruska pod flagą biało-czerwoną], Budapest: Európa K., 2003. Prendi tutto, Milano: Frassinelli, 2004. Polsko-russkaja vojna pod belo-krasnym flagom [Wojna polsko-ruska pod flagą biało-czerwoną], trans. Irina Lappo, Moskva: Inostranka, 2005. Sneh a krv [Wojna polsko-ruska pod flagą biało-czerwoną], Bratislava: Ikar, 2004. Blanco nieve , rojo Rusia [Wojna polsko-ruska pod flagą biało-czerwoną], trans. Joanna Orzechowska, Barcelona: Mondadori, 2005. Author: Paweł Kozioł, December 2008. Edited and revised by Agnieszka Le Nart, October 2011, updated Oct 2015 by GS.